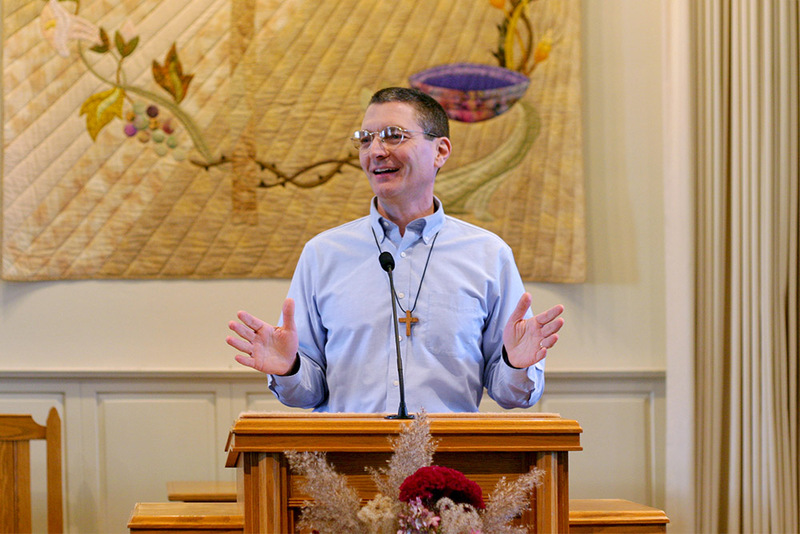 Listen to and download East Chestnut Street Mennonite Church sermon recordings. If you enter from the rear of the building (parking lot doors), you will already be on the same level where we gather to worship. However, the doors open behind the pulpit, so after 9:15am you may prefer to enter in the back of the worship service, which is through the front of the building. By entering here, we offer an elevator which goes between the three levels of the church. There is a small parking lot immediately behind the church with handicap-accessible spaces. There is street parking on East Chestnut Street, both sides, in front of the church. 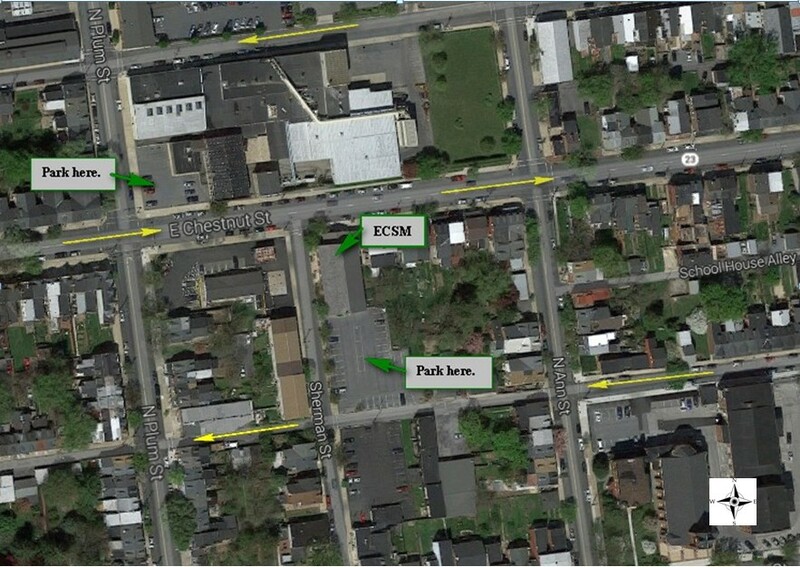 Additionally, we are permitted to park in the J. Walter Miller parking lot on the northeast corner of North Plum and East Chestnut Streets on Sunday mornings; however, cars must be moved out of this lot shortly after the end of Sunday morning services so the ECSMC closer can lock the gates. Children are encouraged to go directly to their classrooms after the service. Adult classes begin 10 minutes after the worship service. Please feel free to get coffee or tea in the foyer before heading off to the class of your choice! Sunday School for children and youth begins immediately after the end of the worship service. Children under age 2 are welcome to join their parents in any of the adult Sunday School classes. Junior Youth (Grades 6-8) meet in the Fellowship Hall. Youth (Grades 9-12) also known as Mennonite Youth Fellowship (MYF) meet for Sunday School weekly, in addition to monthly gatherings. Many of our classes use the Adult Bible Study resources from Mennonite Publishing Network, also known as the Uniform Series, or the International Lessons. This is a series of lessons built around a scriptural theme or portion of scripture, with a lesson for each week of the quarter and questions for discussion. Uses the Adult Bible Study curriculum. Most members of the class are of retirement age, but welcome visitors of all ages. We desire to be a light in our church and community. Sharing current happenings and needs is important to this group, so time for this is given at the beginning of each class period. We are an inquiring group, yet pretty firmly anchored by our convictions and our wish to live faithfully. We talk about our lives with each other as we read and discuss the biblical passages designated by the Adult Bible Study curriculum each Sunday. This class, with shared leadership and lively discussion, focuses on issues concerning faithful and relevant Christian living. The class sometimes uses the Adult Bible Study curriculum. All ages are welcome. Consists of adults heading into retirement years addressing issues of life and faith. The class uses the Adult Bible Study curriculum most of the time and works on ways to reach out to newcomers in the church. Each quarter one elective is offered to all who are interested. 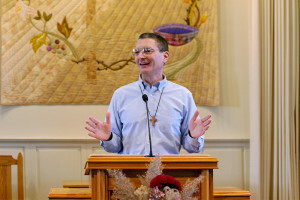 During the winter quarter (December, January, and February) the entire adult curriculum becomes electives and the congregation has the opportunity to experience Sunday School in a different way.